bubbles and jellies. finished., originally uploaded by stephiblu. i finished this one up today. 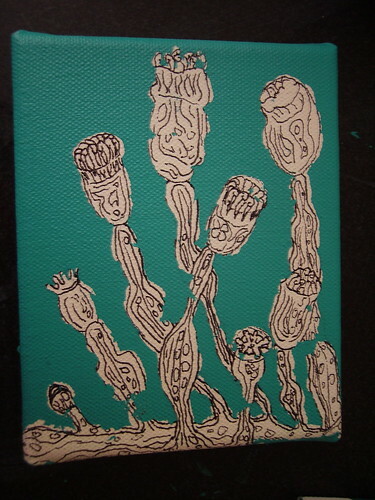 acrylic and ink pen on canvas. underwater buds. pedicellina echinata. finished. underwater buds. pedicellina echinata. finished., originally uploaded by stephiblu. 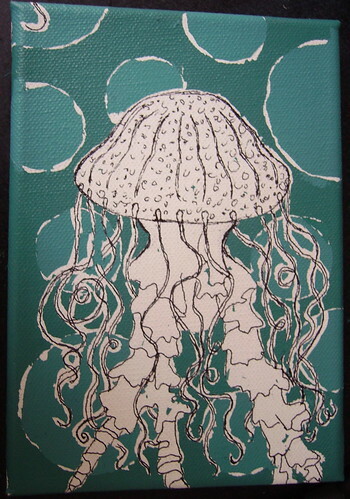 new paintings. finished this one last night. 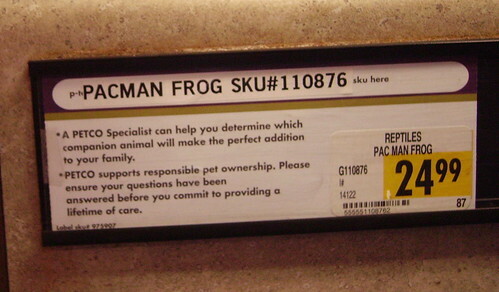 omg there really is a pacman frog! here is another photo this one has a turtley pattern. This frog is relatively common in the pet trade, and gets its common (pet trade) name from the popular video game. The frog’s generally rounded appearance and huge mouth led to the cute name. The frog’s scientific name is Ceratophrys ornata, and it is also known as the ornate horned frog. Pacman frogs are native to South America, and are terrestrial in nature. In fact, they are very poor swimmers and care must be taken that they do not drown in their water bowls. These frogs are quite large, and can reach around 6-7 inches in length (15-17 cm), although males tend to be quite a bit smaller than females. They are generally about as wide as they are long, so are quite hefty for a frog. Their appetite matches their size, and they will pretty much eat anything that moves. Pacman frogs have a reputation for being somewhat aggressive, which is largely undeserved. While they do sometimes bite, it is usually a case of the frog feeling threatened or simply confusing a finger with a food item. FROM ABOUT.COM ARTICLE, link above. gees! frogs are almost as cool as turtles, almost. pacman frog., originally uploaded by stephiblu. is there really a pacman frog? spiderman and cousin chad, originally uploaded by the lovely brenda photographer. did you find this spiderman mask on the B61? if so click the picture and send message or comment. pic by the lovely brenda! spiderman, marco, and abe were taking the B61 bus to sadie’s 5th birthday party sunday morining around 10am from Williamsburg to Greenpoint. if anyone finds spiderman’s mask please email me. Thanks so much! 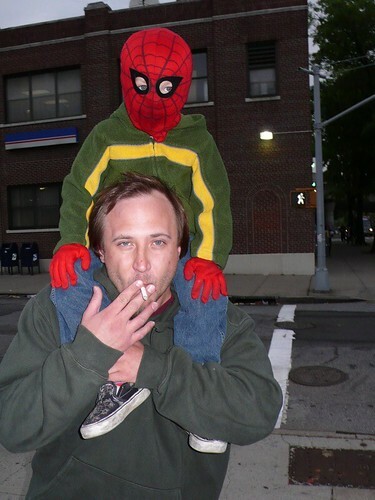 below is attached the most recent photo of spiderman with cousin chad. so you can still sign up for shares! There is still time to join the Williamsburg CSA for the 2007 growing season. There is still time to upgrade from half to full shares or add a flower or egg share. Brought to you by the City Reliquary Brooklyn Civic Riders B.C. Havemeyer St. btw. Grand & Hope Sts. This is the last email blast to remind people to sign up. From here on out, we will only be sending out emails to members. Right now, our Member email list is 85% complete but we are working on getting everyone added. (sorry guys, but i must float the disclaimer…the core group is all volunteers who organize the CSA in our “free” time for “fun”. Everyone who has signed up (and gave us their email) should receive a confirmation email by Sunday June 3rd. This email will explain pickup & assign half shares to A or B week schedules. we would like to invite anyone who is interested to join the Core Group. Email williamsburgcsa@gmail.com with the subject line Core Group for more info. Our first monthly meeting will be Sunday June 3 at 11:00 in Greenpoint near McGolrick Park. At this meeting, we will be going over the 2007 #s, the low income share program, the “leftover” share food donation, weekly newsletter emails, the blog, monthly events, trips to the farm, and all the special projects like fundraisers and murals and lots of other exciting creative things. There is so much to do and not enough of us to do it…so, if you would like to get more involved in local sustainable food systems, then come and join us! !